Gord is a sports enthusiast, supporter, volunteer, mentor and community leader. His contributions are enormous and include ~ but are not limited to ~ servicing the Optimist Club of Stanley Park, the Kitchener Sports Association and Kitchener Minor Girls Softball. A member of the Optimist Club of Stanley Park since 1989, Gord was recognized by the club for his contributions by being named a Life-Time Member. His involvement includes coaching ball from 1989 through 1996; Chair /Co-Chair of the Ball Program since 1993; responsible for the set-up, programming and maintenance of the websites for both the club and its Ball Program; the club’s chief photographer; volunteer at Club events including bi-weekly bingo sessions, Grand River Bass Derby, Annual Bike Rodeo, Oktoberfest, and Sledge Hockey Tournament; and responsible for fees, budgets, age brackets, schedules, equipment, trading cards, trophies, sponsorships, uniforms, team assignments, umpires, ongoing daily supervision and wrap-up party! 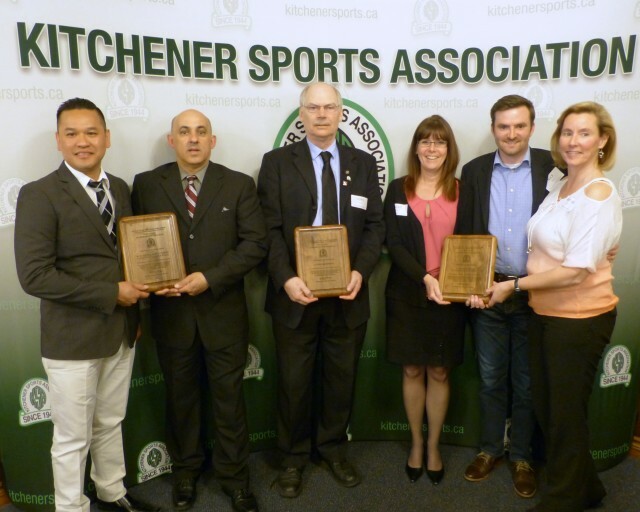 Never far from sport, Gord has been a contributing member of the Kitchener Sports Association (KSA) since 1994. He served as Vice-President from 2006 to 2008, President from 2008 to 2012 and currently donates his time as a Director, member of the Executive & Operating Committee, member of the Scholarship Committee since its inception, Chair of the Athletic Excellence Committee and Chair of the Fee-Assistance Committee. He is responsible for maintaining KSA's displays at the Activa SportsPlex, KSA's website and KSA content for SportsXpress. He collects the dinner fees, handles the operating expense account, acts as KSA's main photographer, is a past member of the Olympic Dreams Committee, 50/50 sales team and Spin 12Team. Gord was an active volunteer with Kitchener Minor Girls Softball for many years and his contributions throughout his involvement include coaching, umpiring, league supervisor, board member ~ Director Recreational Division and acting president. Promote interest in minor or amateur sports for young men and women. Promote and encourage community pride and spirit through involvement in minor or amateur athletics. Arrange or assist with games, competitions, tournaments and other activities to further the promotion and playing of amateur sports. Civitan Sports sponsored sports-related projects, tournaments and locally based teams and individual athletes from the Waterloo Region and surrounding areas. Through its continued commitment to sport, the community and individuals, the orgranization raised funds through the operation of various sporting events including the Civitan Jamboree held for bantam and midget-age girl softball players, charitable bingos and Nevada tickets sales. The Jamboree, a locally held tournament, embraced both sport and building friendships and became the main fundraiser for the organization. The funds generated were distributed in response to requests from various amateur athletes, minor sports associations and teams to assist with costs associated with their programs including participation in provincial, national and international events. The organization’s vision was to support as many athletes, associations and events throughout the Region of Waterloo as possible: skiing, hockey, Angels in the Outfield, swimming, golf, Record Playground Foundation, boxing, baseball, Friendship Cup, athletics, lacrosse, Big Brothers, softball, K-W Habilitation, Blue Convention for Umpires, lawn bowling, scholarships and Special Olympics. International Pink Day: Each year, a practice session is dedicated to the International Pink Day in order to bring awareness of bullying to players, families and KSC members. Players and coaching staff get dressed up in pink. The U15A practice is an eye-opener for those in attendance and raises much dialogue and discussion amongst teams. KSC Food Drive: The entire team organizes an annual local door-to-door campaign seeking food and cash donations. Over the past four years, the girls have raised $6,900 dollars. Sertoma Christmas Miracle: Each December, members of the team conduct a Bottle Drive in the community in order to raise money to support several local families. With the $400 to $500 collected each year, the U15A team spends an enjoyable evening shopping and wrapping Christmas gifts for children and respective parents.